Have you got ready for X-Men: Days of Future Past, another Hollywood blockbuster, and also a 20th Century Fox big movie? Whether active or passive, you must have noticed that X-Men: Days of Future Past related news, reviews, videos and other discussions are coming thick and heavy on web pages. As a hot movie, there's no doubt that many movie fans will seek for solution to rip and copy DVD X-Men: Days of Future Past for various reasons, such as DVD main title copy, DVD to ISO file/VIDEO_TS folder, and transfer DVD movie to iPhone, iPad, Android and more mobile devices. Plot summary: The background is based on the near future. Mutants – humans born with superhuman abilities are hunted and killed by sentient robots (Sentinels) designed by Bolivar Trask. They're in danger of becoming extinct. For the survival, X-Men's only hope is to back to the past and change history before being killed by Trask. Finally, the X-Men send Wolverine to the past and prevent the disaster that results in doom for both humans and mutants. -	The perfect blend between character-driven drama and fun, edge-of-your-seat spectacle! -	Bryan Singer's magic flourishes on screen… X men beats everything else!!!!!! -	A stunning achievement-a blockbuster movie packed with at least as much heart as spectacle. From X-Men: Days of Future Past review, it is the one to watch and treasure in the form of DVD. X-Men: Days of Future Past DVD was released October 14, 2014. But DVD disc is likely to suffer from scratch, crack and worn and impossible to be loaded in wide-screen mobile handsets for playback. For whatever reasons, ripping and copying DVD X-Men: Days of Future Past is exceedingly necessary. How to rip and copy? The following will introduce you an effective solution to rip and copy DVD movies including X-Men: Days of Future Past DVD to hard drive, smartphones, or tablets. Many people may have this kind of experience: purchase a DVD ripper hopefully but only to find that the software is unable to load DVD information or export with disordered movie content, and damaged audio/video. How could this happen? Actually, commercial DVDs distributed by 20th Century Fox, Walt Disney, DreamWorks, Warner Brothers, etc, are encrypted by strong encryption technologies, like Disney X-project DRM, CSS, RCE, Sony ArccOS, UOPs, out of copyright protection. To rip X-Men: First Class 2 in high quality, you need to rely on a professional DVD ripping program which can access all DVD encryption technologies and then rip and copy DVD movies to PC, mobiles or Mac. And WinX DVD Ripper Platinum is the one you're looking for. WinX DVD Ripper Platinum is a one-stop tool combined with DVD ripping, DVD copy and video editor. It is able to remove all copy protections built in DVDs including X-Men: Days of Future Past DVD, Guardians of the Galaxy DVD and rip DVD to hard drive in the formats of MP4, AVI, WMV, MOV, M4V, MKV (available for Mac version) and others, transfer DVD to popular devices including iPhone, iPad, Google New Nexus, Samsung Galaxy, Amazon Kindle Fire, PSP, Xbox, etc. Let's back to the point – how to rip DVD X-Men: Days of Future Past. 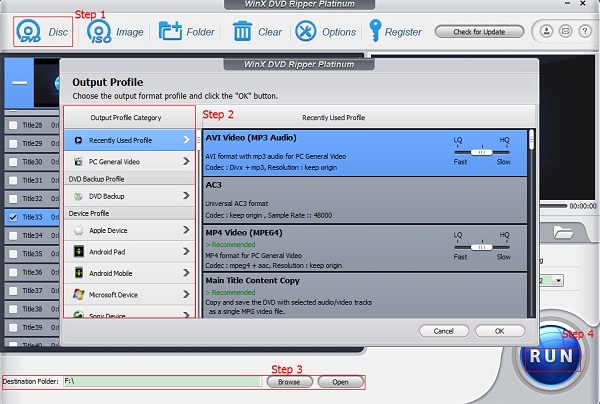 And this guide will show you detailed steps to process X-Men DVD ripping by WinX DVD Ripper Platinum. Before any further, please download WinX DVD Ripper Platinum from the "Free Download" icon and install it on your PC or Mac. Here, let's check how it works on PC. Step 1. Import DVD X-Men: Days of Future Past by clicking "DVD Disc". After loading DVD successfully, this tool will automatically select main title and pop up a window for setting output profile. Step 2. Specify Output Profile. Back up DVD full/main title, clone DVD to ISO image/VIDEO_TS folder, or rip DVD to popular devices? It totally depends on you. Step 3. Click "Browse" to select a destination to save digital copy of X-Men: Days of Future Past. Step 4.Hit "RUN" to carry out X-Men: Days of Future Past DVD ripping. To make it more stable and output better quality with faster speed, you're suggested to check "Use High Quality Engine", "Deinterlacing", "Safe Mode" and set "CPU Core Use".